Here’s a theory: We can mark the moment a director truly blossoms into his or her own as an artist by when they chose to break a cinematic convention. Example one: the reverse shot in Paul Thomas Anderson’s “There Will Be Blood.” Or we should really say the lack thereof. The film emphasized its singular focus on its singularly focused main character by often not cutting away from him, even when convention would dictate otherwise. In a stand-off between Daniel Plainview (Lewis) and Eli Sunday (Dano), even when side characters speak, the camera stays focused on the two men. Here is where the real dramatic tension is, the technique tells us, focus on this, the real story. The technique is repeated throughout (see: Plainview ordering a steak, or Plainview at the Sunday church, or Plainview meeting Paul Sunday) and, one could argue, marks the moment when Anderson stepped away from the frenetic, overcooked orchestration of Magnolia and Boogie Nights (stylistically derivative of Altman, emotionally derivative of Spielberg) and stepped into his own right. Then, perhaps, we can say the same about Christopher Nolan and “Dunkirk.” In his latest film, he flouts an entirely different cinematic convention: audible dialogue. It’s as if Nolan saw that scene in “The Trip to Italy” where Steve Coogan and Rob Brydon mock “The Dark Knight Rises” for having completely unintelligible scenes of dialogue from both the film’s protagonist and antagonist, and Nolan decided to double down. “Oh you think Tom Hardy was difficult to understand through the Bane mask? Try understanding him through a WWII fighter plane comm system,” Nolan seems to say. Between the roar of the plane, the incessant ticking of a clock, the mumble of a perpetually broody character actor, and a Hans Zimmer score sitting way too high in the mix, it’s completely impossible. I would say thirty to forty percent of the dialogue is essentially inaudible. But what is even more remarkable is that seventy to eighty percent of the dialogue isn’t even necessary. Which is not to say that there is too much dialogue in the film. Far from it. The film seems to challenge “There Will Be Blood” for how long it can go before it needs its first line. But, whereas that film resolved its opening silence with a long monologue, like gasping for air after holdings its breath, “Dunkirk” seems more than comfortable in its taciturn nature. There is some brief overheard exposition about the state of the war, but this is essentially meaningless to the stories that the film is really following, and the film very much seems to know this. There is a gang of soldiers that yells at another soldier, but the words that they yell are much less important than the fact of their yelling. 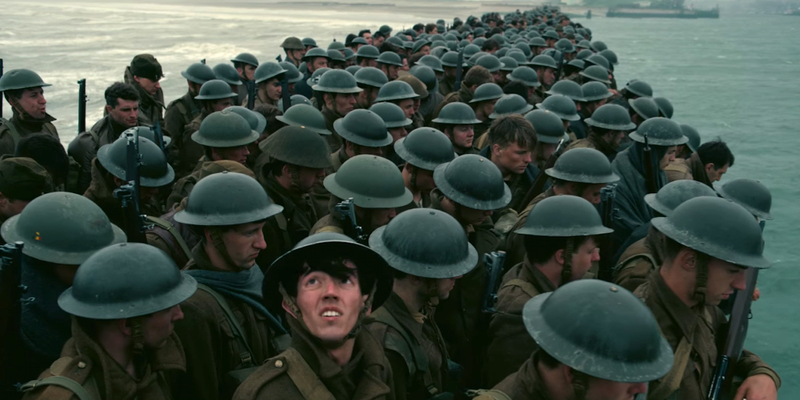 Except for a concluding monologue, a hinge the film uses to swing towards the sentimental, “Dunkirk” could be in a foreign language and the viewer would not miss much. It wouldn’t be fair to say the film relies solely on visual storytelling — the sound design, from the skin-jumping sounds of the machine gun fire to the mix of score, lapping waves, and yes-its-still-going ticking clock, is impeccable and integral. Rather, the film is told through the language of cinema rather than the language of dialogue. There are a number of other things to talk or think about with Dunkirk. (Here’s just one: count the number of Germans you see in the film. Or, here’s another, the number of women.) And the film is not without its faults. The pivot towards the sentimental at the end felt hackneyed to me, both unearned and unnecessary. And, perhaps one could excuse the lack of racial diversity as this being an English story made up of English characters, but is England only made up of pale-skinned black-haired boys? And are we to really believe the hundreds of thousands of men at Dunkirk were so physically homogeneous that a tuft of blond hair sticks out like a sore thumb? And, really, how could you possibly explain the lack of any female character? But if “Dunkirk” doesn’t stray from the questionable politics and timid casting that has plagued Nolan’s career, it does leap forward in terms of his artistic vision. And, much like “There Will Be Blood,” it represents the maturation of a filmmaker, progressing beyond the loud, bold grabbing of low fruit of his early work and onto something both more challenging and rewarding.